Brain Fitness and Brain Exercise is in. Your brain is designed to change for the better if you know how. Healthy vertebrate animals use their brain to get a cortical response which changes the feel of their muscles. This allows them to have the grace, strength, power and agility we admire. The process an animal goes through has been identified by Thomas Hanna as the pandicular response. Just like a healthy animal, you can systematically exercise your brain in a direct way to change the resting levels of your muscles. Big deal? Yes it is, though most people don’t think about it. Learning how to contract yourself in a very specific manner and then allowing for a release can quickly demonstrate to you how fast your brain changes the resting levels of your muscles. Change Your Brain & Instantly Free Yourself. If we hooked you up to a biofeedback machine and have you do the following maneuver, you’d see how the resting levels of your muscles will change in a flash. • Do not force the movement. • Move well within your comfort zone. Caution: Be careful, listen first to the demo, then go ahead and try it. Remember, do not create a lot of force, otherwise you might rachet up any pain you feel. Stay within your comfort zone. Wait for it to load in and try it for yourself. Did you notice any changes? If you didn’t, that’s cool, thanks for giving it a shot. If you did? How about trying some more Brain & Body Changing Moves? 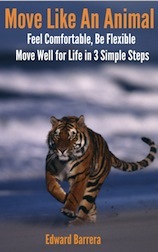 Brain exercises and brain fitness like somatics exercises offers you a new way to move like the healthy animals we are.